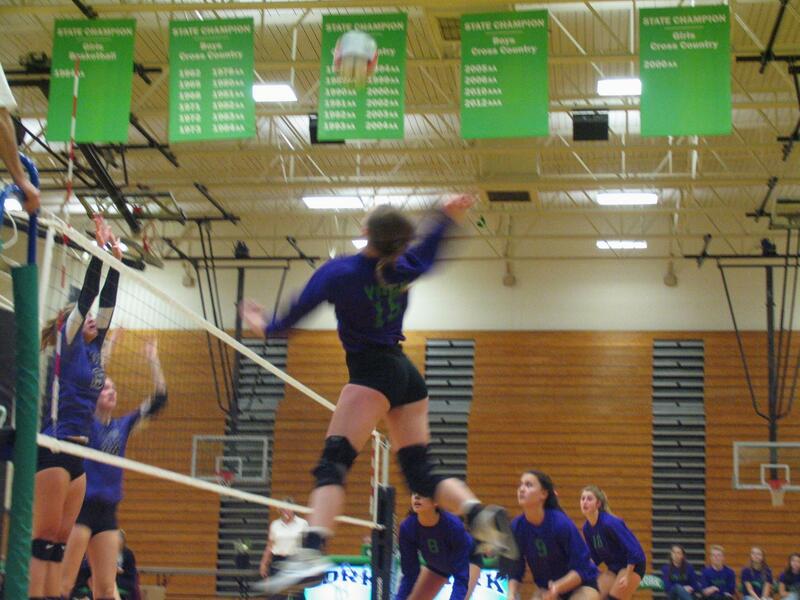 Sophomore Georgiana Barr jumps up to spike the ball and score a point. Despite their recent loss to Downers Grove North, the varsity volleyball team has seen success in their games while helping to support some important causes this season. For their game Tuesday night, they teamed up with Relay for Life and raised money for cancer research, as well as continuing to push their efforts to end the use of plastic water bottle at York. 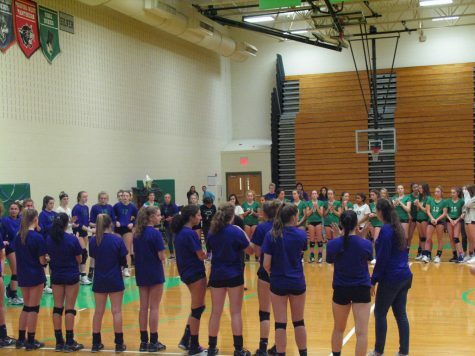 During their game on Tuesday night in the Paul Campbell Gym, the girls of varsity volleyball played hard, and raised money for Relay for Life. Through raffle sales, they raised $2,078 of donations for the American Cancer Society, making it their most successful fundraiser they’ve had. Before the game, they honored team members’ family and friends who have been affected by cancer, followed by a moment of a silence and a competitive, fun game. The varsity and JV girls volleyball teams honor cancer survivors and victims at their Relay for Life fundraiser game. Before the game, the team also handed out reusable water bottles to their fans as a way of spreading awareness about the damaging effects single use plastic water bottles have on the environment. The girls have been making this effort their entire season and spreading it to their peers. “The plastic crusade started as just a team thing, but we realized that we can expand our views onto the school and possibly get more people to help recycle and use reusable water bottles instead of single use,” senior Nicole Geib said. 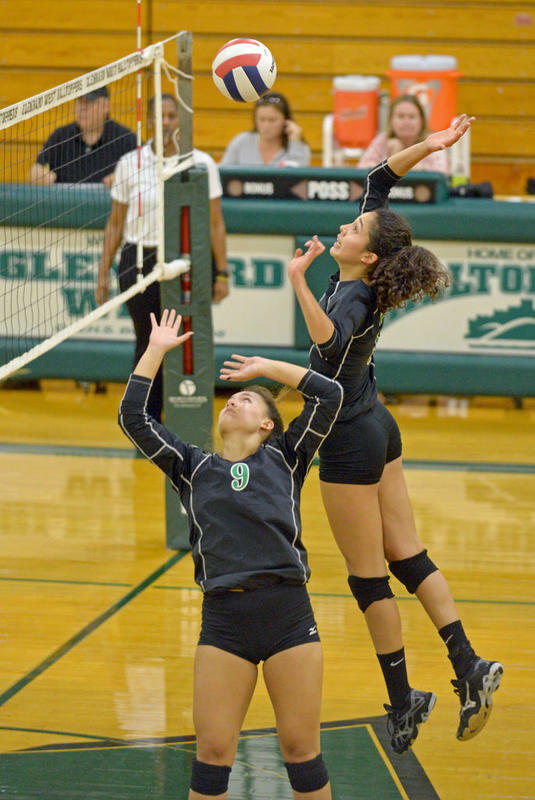 Behind the scenes, the girls are doing much more than just practicing volleyball. They put endless work into each of their causes. Researching the issues and making posters not only enables them to bond as a team but also helps them get behind the issues the team is supporting. They want people at York to make the eco-friendly change to reusable water bottles because they truly believe in the cause. Senior Sophia Glabus jumps up to hit the ball over the net. Coach Iverson thinks it is important to support causes like this in order to grow as people. Helping the environment and people who are suffering from cancer gives the girls a deeper meaning as they are playing. While that has been a significant part of their season, volleyball is still the team’s main focus, and it shows in their games. While confident in their skills, the girls did not expect to see the amount of success they’ve had this season. It didn’t start out how they would’ve liked, but they worked hard anyways, and it’s paid off. . Seniors Samantha Kao and Asha Labine jump up to get the ball over the net and score a point in their comeback game against Glenbard West. Girls varsity beat Glenbard West for the first time, since 2015, and it sparked a winning streak. They dominated St. Ignatius, Hinsdale Central, Hinsdale South, and many more strong competitors. Success followed them all the way to Senior Night where they beat Lyons Township in three games. None of them expected to play as well as they have this season, and they are hoping to push all the way to State. Their success has completely changed their mindsets, and they are more competitive than ever. 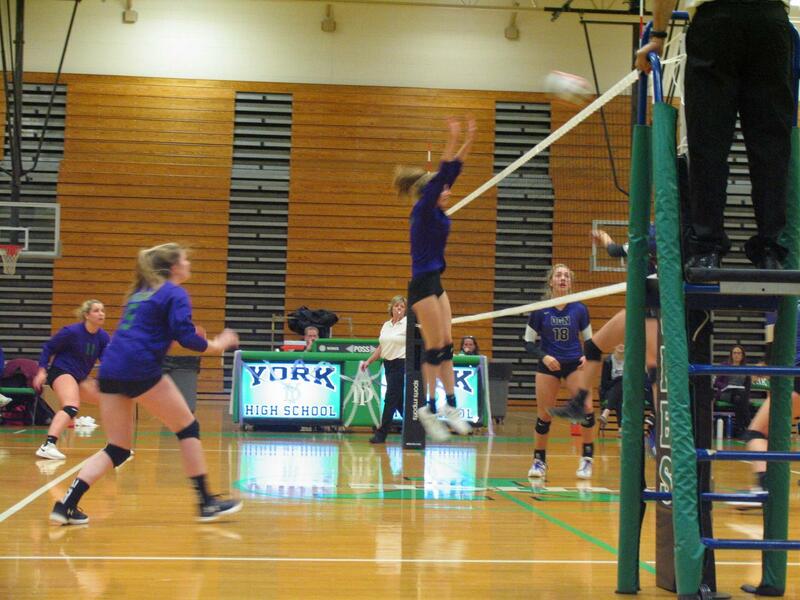 Be sure to stay tuned for York Girls Varsity as they enter playoffs… Good luck girls!